Yes, the recipe calls for a whole head of garlic, not just a clove of garlic. 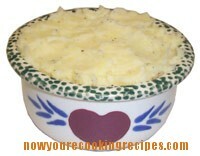 But the baking makes it sweet and mild, and it adds great flavour to “plain old” mashed potatoes. Sweet roasted garlic is a great addition to mashed potatoes. Trim ½ inch off the top of the garlic head. Wrap with tinfoil. Bake at 400 degrees F. for 45 minutes. Peel, cut up, and boil potatoes. Drain. Return potatoes to saucepan, and heat over low heat for 2 minutes, shaking pan occasionally, to dry them. Remove from heat. Squeeze garlic out of skins into the potatoes. Add butter. Mash with potato masher until smooth. Add hot milk, salt and pepper. Stir in. Makes 4 servings.